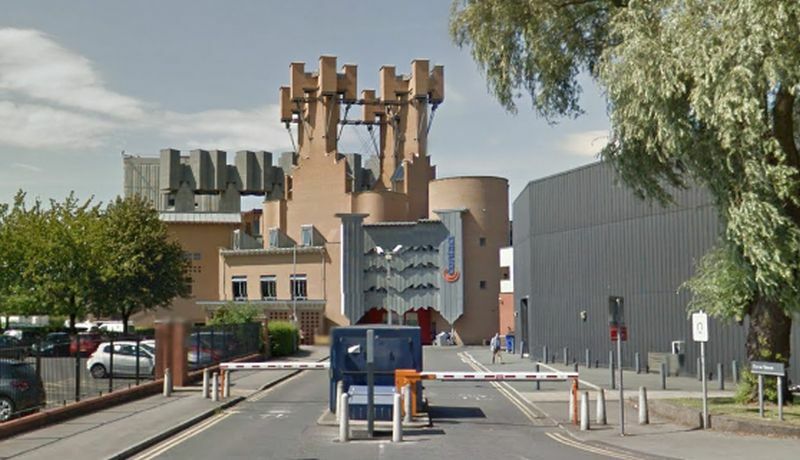 The Contact Theatre was founded in 1977 by Barry Sheppard (General Manager of Manchester University Theatre) and Hugh Hunt (Professor of Drama), as the Manchester Young People's Theatre, a part of Manchester University. 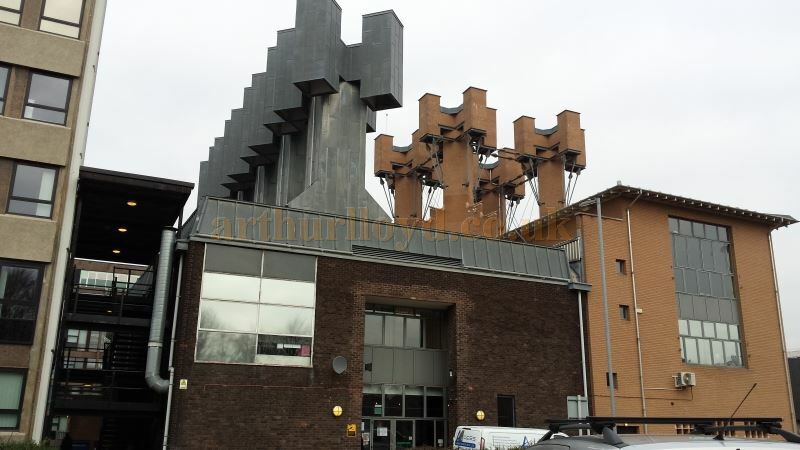 The Building was later redesigned by the architect Alan Short following an investment of £5 million by The Arts Council of England. 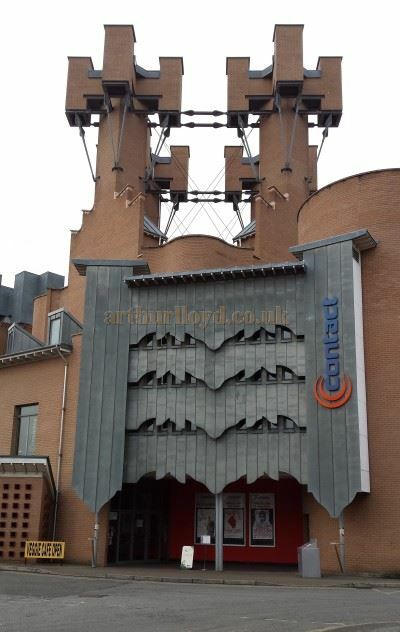 The Theatre was then reopened as the Contact Theatre, an Arts Venue for young people, in 1999. Right - The Contact Theatre, Manchester in March 2015 - Courtesy George Richmond. 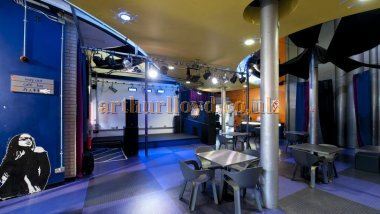 The redesign included the refitting of the 320 seat principal auditorium (Space 1) and a new 80 seat studio (Space 2). Other amenities were also included (see below). Above Left - The Foyer of the Contact Theatre, Manchester - Courtesy Kate Gambrell of the Contact Theatre. The exterior of the building is particularly striking, being dominated by nine huge stacks at roof level crowned with H shaped chimney pots. These attention grabbing elements are of practical use assisting with the buildings natural ventilation. The overall effect of this design element makes the building difficult to ignore from Oxford Road. The Theatre is supported by various bodies including, Arts Council of England, Manchester City Council, and A.G.M.A (Association of Greater Manchester Authorities). 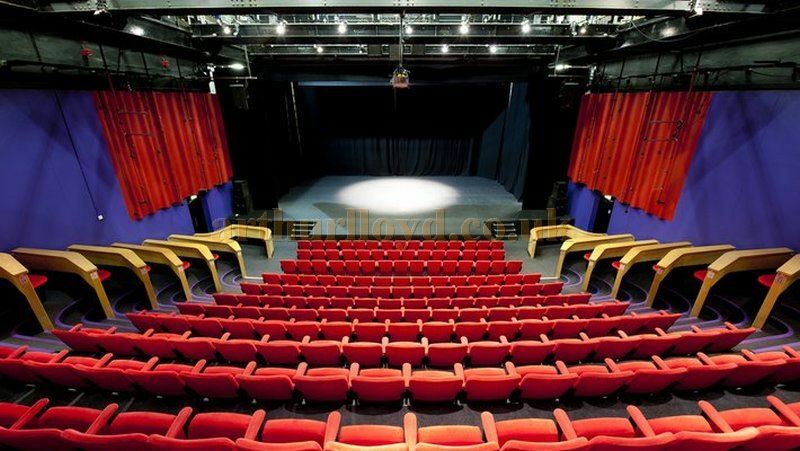 However the Theatre is run independently and the high standards achieved have won numerous awards. Left - The Contact Lounge - Courtesy Kate Gambrell of the Contact Theatre. 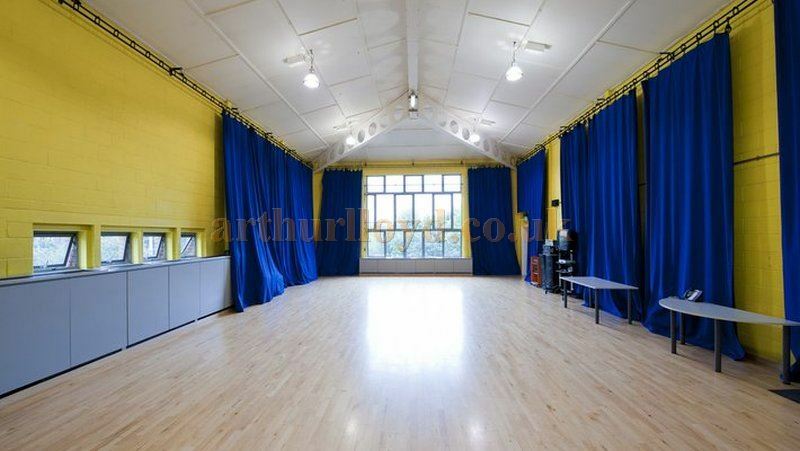 Besides the two performance spaces mentioned above there is a purpose built rehearsal room with polished wooden floor and excellent natural light. In addition a media lounge is available complete with soundproof booth. The public is well catered for in the Contact Lounge. 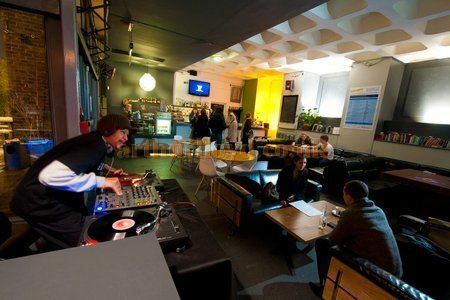 The Contact Lounge is a stylish in house bar and restaurant, serving tea, coffee, seasonal food and a variety of beers, spirits and wine. The lounge is spacious and a beer garden is available, weather permitting. Above - The Contact Theatre, Manchester in March 2015 showing the large window of the Theatre's Rehearsal Room to the right - Courtesy George Richmond. Returning to the Proscenium Theatre (Space 1 shown below) the width of the stage, wall to wall is 15m 80cm, this is masked down to create a proscenium width of 13m, the depth of the permanent stage is 7m 50cm. The depth of the stage can be increased creating a thrust stage via two independent forestage lifts each 7m 28cm wide X 3m deep, these can be used together or singly. The use of one reduces the seating capacity to 277. The use of two reduces capacity to 233 from the maximum capacity of 320. Crossover is via a backstage corridor. There is no fly tower although, depending on the lighting rig in use, smaller items can be flown. 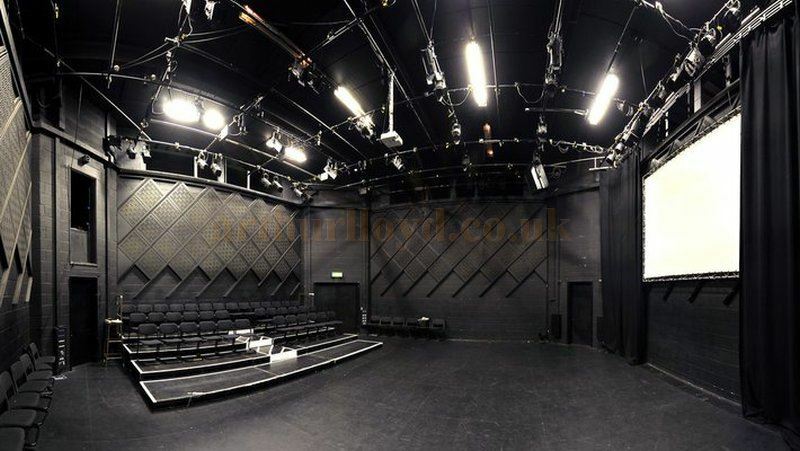 The Studio (Space 2 shown below) is a versatile black box with provision for lighting and sound and bearing in mind the seating capacity of 80 can be infinitely variable. The Contact Theatre and its dedicated staff offers a great service to the community and a full account of what is available can be found on the Theatre's own website here. The above article on the Contact Theatre was written for this site by George Richmond in April 2015 . The information on which the text is based, and the interior images, were kindly supplied by Kate Gambrell of the Contact Theatre.